Michael McFadyen's Scuba Diving - Toothpaste - Toothbrush Island South The Five Islands Nature Reserve is composed of, as you would imagine, five islands a couple of kilometres from the city centre of Wollongong. The diving off all of the islands is basically good, with number of spots being exceptional. The northern end of one of the Five Islands, Flinders Island (better known as Toothbrush Island since it looks so much like a toothbrush), is a shallower dive (about 16 metres) with two very good caves. This is called Toothbrush Island Cave. 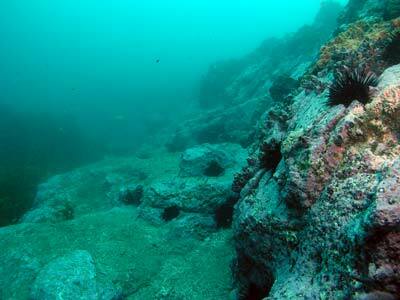 As well as this location, there are more dive sites around the island. 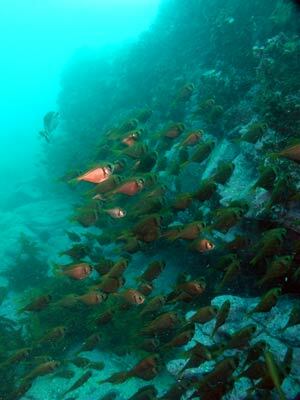 This dive is located off the southern end of the island, near the "toothbrush" part. We have called it Toothpaste as it is just off the end of the island and shaped a bit like toothpaste. The best boat ramp is in Outer Port Kembla Harbour behind the BHP Steelworks. From here, head out to the distinctive island, go to the southern end and go just off the end. Go to GPS Reading (TO COME) and you should be in about 10 to 12 metres. As you approach this spot from the south, the depth comes up from 24 metres well out from the island to 15 to 17 metres and then in one jump to 10 metres or so. Anchor here. If there is a southerly, anchor in the deeper water. If anchoring in a northerly, note that the flat reef top does not have many good holding spots. Once on the bottom, head south to the wall's edge (if you are diving in a southerly you will find the edge as you descend). You will see that the wall is a good two to three metres high. Head to the east and follow the wall as you go. Off to your right there is a huge amount of kelp covering the rocky bottom. There are some larger rocks and boulders in this area. If the visibility is good, you might want to go over and have a look. The wall turns to the north and goes this way for 40 metres or so. The reef here is composed of the pinky rock that is so common to the Wollongong and Shellharbour area (as well as further south). There are some nice sponges and sea tulips as well as lots of gorgonias. Some of these are large, but most are small. There are lots of colours, pinks, reds, oranges and yellows are but some. Keep following the wall, making sure that you stay between the wall and the kelp. You will have turned a little to the north-east and after about 30 metres the wall turns back to the left (west) and comes to a sort of point. This area has huge numbers of bullesyes. 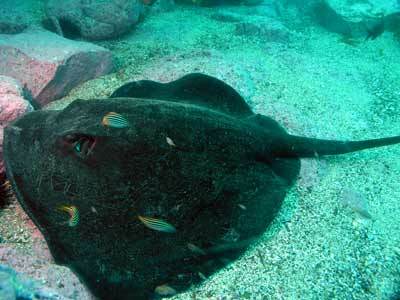 We also saw a huge bullray here (see the photograph at top). Off here there is a large boulder and this is nice as well. From here head south (perhaps south-west) following the wall and you will come to a more open area with a large boulder off the the right. Turn left to go south or south-east and in about 25 metres you will be back near the anchor. 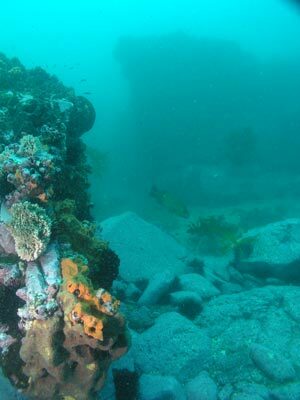 As it will only take you 20 minutes to slowly go right around the site, you can explore some of it again or make some explorations out to the south over the kelp.